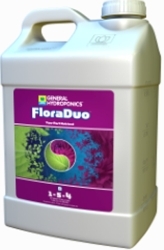 FloraDuo is a two-part mineral nutrient, FloraDuo Grow and FloraDuo Bloom. FloraDuo is an easy to use two-part fertilizer. With only two bottles, it is possible to obtain a large range of different nutrient blends to meet the needs of all plants through every phase, from seedling through harvest. The ratios of primary, secondoray and micronutrients adjust as you mix in different amounts of A and B, thus tailoring your nutrient blends to meet your plants needs. Floraduo can be used for all plants in prepared soil mixes, coco blends and garden soils. Mixing Directions: Measure fresh water, then measure Floraduo, add to water and stir. Maintain pH in the range of 5.8 to 6.8. A conductivity meter is recommended to measure and maintain nutrient stregnth. The nutrient solution should range between 600 and 1,200 ppm. To provide your plants with correct nutrient spectrum and obtain the right balance of nutrients use A and B as seen in chart. FloraDuo B can be used alone as a bloom booster for garden plants, foliar feeding and hydroponic reservoir top-up for the bloom phase. Add 1 -3 tsp of B per gallon of water.